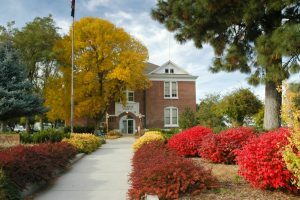 The Sherman County Courthouse in Autumn, captured here by Gary Halvorson of the Oregon State Archives. The Finance Department is responsible for the preparation and management of the annual county budget, payroll, benefits, and all human resources requirements for Sherman County employees. It also is responsible for financial accounting and reporting for Sherman County. The Finance Director in the Finance Department provides most, if not all, of those services. Sherman County Court appoints three citizens to serve on the Budget Committee with the County Court. It also appoints the Budget Officer. The Finance Department has, over the years, been identified by names that include the Finance Office, Budget & Fiscal Services, and the Financial Services Office. In years past, the Finance Department also included the tax office. As of late-2017, those two departments have been separated out into two online sections for your convenience: the Finance Department and the Tax Collector. You can pay property taxes by mail, by phone, online, or by dropping it by the Sherman County Courthouse. Find payment details on the Tax Collector’s “Options for Payment” page. Property owners may appeal the value of their property or penalties assessed for late filing of real or personal property returns. All personal property tax is delinquent when any installment is not paid on time. Is property line or title information available online? No, currently Sherman County does not have property information available online. However, you can come by the Sherman County Courthouse between 8 a.m. to 5 p.m. to get titling, zoning, property line, and other information from the County Clerk’s Office or the Assessor’s Office. How can I get a copy of Sherman County’s budget? Sherman County’s current budget can be accessed on the County Court Budget search page. Can I get a job with the Sherman County Sheriff’s Office? Fill out the County’s Application for Employment and mail it to Sherman County, P.O. Box 365, Moro, OR 97039. Indicate which position(s) you are applying for in the gray box on page 1. What services are performed by the Sherman County Finance Department? The Finance Department, also known as the Financial Services Department or Finance & Tax Office, provides many services that support all Offices and Departments under Sherman County Government. Services include: Accounts Payable, Accounts Receivable, Payroll, Budget/Audit, and Road Cost Accounting. The Financial Services Department also administers Property Tax Collection and the Resident Incentive Program. When are taxes levied for manufactured structures? The Sherman County Tax Office sends out manufactured structure tax statements in late October of each year representing taxes for the current tax year, July 1 through June 30. The tax is due each year by November 15th. Sherman County’s Board of Property Tax Appeals offers a process for citizens to request a reduction of the value of their buildings, manufactured structures, land, industrial machinery, and industrial equipment. Appeal forms are online; see “How to appeal your property value” for further details on the hearing process. Note that property value, not taxes, are the subject of the hearing. What is a “tax statement”? The Sherman County Tax Office sends out four distinctly different property tax statements — real, personal, manufactured structures, and utility — in late October of each year representing taxes for the current tax year, July 1 through June 30. How do I change the address where my property tax statements are mailed? There is a change of address form located on the back of the return portion of your statement. Simply fill this out and return with your payment. If you have yet to receive your tax statement, simply contact the Finance Director to update your address information. Why is my property tax statement green? Why is my property tax statement yellow? If your property tax statement is yellow, it means either a mortgage company or the Disabled and Senior Citizens Property Tax Deferral Program is paying your property tax for you. This statement is for your records. Why do I have different colored property tax statements? How can I make property tax payments? You can pay by mail, at the Courthouse, by telephone, or online. There’s a “convenience fee” — levied by our secure-payment processor — for the latter two options. See our “Options for Payment” page for specifics. Do I have to pay interest on overdue property tax? Interest is charged on any past due installment(s) for the schedule you are following. By Oregon law (ORS 311.505), the interest rate is 1.333% per month or fraction of a month until paid. Full payment — Pay the “Full Payment” amount on or before November 15 and receive a 3% discount. Two-third payment — Pay the “2/3 Payment” amount on or before November 15 and receive a 2% discount. The final one-third payment is due by May 15. One-third payment — Pay the “1/3 Payment” amount on or before November 15. There is no discount. The second one-third payment is due by February 15, and the final one-third payment is due by May 15. Sherman County does send out reminder notices. Property tax payments must be applied to the oldest tax-year owing. When will I receive my property tax statements? Tax statements are mailed on or before October 25, to each property owner in the county. If you do not receive your statement by November 1, please call the Tax Department at (541) 565-3623. What is a property tax “exception event”? Maximum Assessed Value (MAV) was established by Ballot Measure 50 for the 1997-1998 tax year. MAV is the greater of 103% of the prior year’s assessed value (AV), or 100 percent of the prior year’s MAV, whichever is greater. MAV’s for properties that existed prior to 1995 were set based on the 1995-1996 Real Market Value (RMV), less 10%. MAVs for “new” properties (constructed or created after 1995) are set by multiplying the property’s Real Market Value (RMV) at the time of construction or creation by the Changed Property Ratio (CPR) for that year. MAV is the only part of your tax bill where a 3% increase limit applies. However, your MAV can increase above 3 percent of the prior year’s assessed value if certain things defined as exceptions are made to your property. Maximum assessed value does not appear on your tax statement. Or if your previous year’s Real Market Value was lower than your Maximum Assessed Value and now your Real Market Value is more than your Maximum Assessed value. If so, you may see a jump in your Assessed Value, depending on how low your RMV was in previous year. Assessed Value (AV) is the lower of last year’s Maximum Assessed Value (MAV) plus 3%, or the current Real Market Value (RMV). This value provides the baseline for your tax-bill calculation. Are there other ways to work with the county outside of direct employment? There are! You can volunteer for one of the many County advisory boards, apply for a paid volunteer position working with Emergency Services, or apply for relevant contract roles. What other jobs are available in Sherman County? Many local employers post their job openings within The Dalles Chronicle, Sherman County eNews, and the Times Journal (Condon) (distributed at Mid-Columbia Producers, 2003 1st Street in Moro, and through $35 annual mail subscriptions via Times Journal, P.O. Box 746, Condon, OR 97823; to place a job ad call (541) 384-2421 or email times-journal@jncable.com). The South Sherman Fire & Rescue also holds Firefighter Academies in April and May — for those interested in firefighting careers. Or, to work for Sherman County Ambulance, contact Shawn Payne at (541) 565-3100. How do I find out about open county jobs? View Sherman County job openings on our Jobs page. You’ll find an information sheet on our Property Tax Payment Options page, with details for mail, phone, and online payment options. Online payments also can be made on Sherman County’s PointandPay.net page. Do I have to pay tax on the income I make in Sherman County? Unlike other cities and counties, Sherman County municipalities fund themselves in ways that do not require additional tax payments on resident or business income. Residents would still need to pay Oregon state taxes and federal taxes (see Free File for IRS-partnered filing options). The lack of municipal taxation in Sherman County can lead to a tax savings for you of up to 3.65% every year. How can I get bid information about contract opportunities with the county? The county’s Requests for Proposals are published on the Sherman County Contracts page. How do I apply for a county job? You can apply to work for Sherman County by filling out our Application for Employment. If applicable, please see the Criminal History FAQ and view the County’s Criminal Check form. Also note that the County uses the Law Enforcement Data System every quarter to check employee driving records.